The State Fair is approaching. Not on small little kitty-cat feet, but on the backs of multiple tires, creaking metal, blowing horses and the backs of hundreds of workers, both temporary and permanent. The grounds are getting their final grooming, the flowers are planted and hung and the ticket booths are in place. 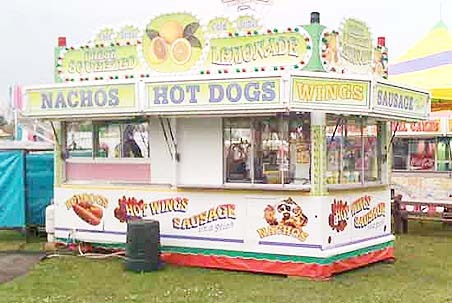 The final arts and crafts are being accepted and the varied food stands are being cleaned out, set up, and the food orders from the wholesalers are being firmed up. The Restaurant Depot, Sysco and US Foods will be busy for the next three weeks. The trailers have started arriving and parking in the two trailer lots. These face the main street that I drive on 2X every day, so I get a good view of the population increases every morning and late afternoon. The first of the roust-a-bout's trailers have arrived. These are a bit different than the standard trailers or RV's that come and park. They have multiple exterior doors, usually either three or four, down the length of the trailer. Each of the doors opens to a small sleeping chamber that holds several people, usually at least two, but no more than six. A typical 3-door trailer will hold as few as three people, one to each chamber, to a maximum of 18 with six people per chamber. In a way, this slowly increasing influx of people reminds me of the circus trains of olden days. The train cars, or in this case the trailers, come into town and begin setting up the big top or the rigging. The excitement begins to build among the populace seeing or hearing that the circus is in town. Before long they will be lining up to pay their hard-earned five cents (well, our admission is quite a bit more than five cents, unfortunately) and entering a new world. A world of wonders, color and sound, acts beyond description and daring. Their minds will be in a whirl, they will eat new foods and drink sweet or alcoholic drinks and, generally, will celebrate the fun of life as shared with hundreds of other people. This is an older State Fair picture at the old entryway. It is a Minnesota tradition and one that I love even with the crowds. 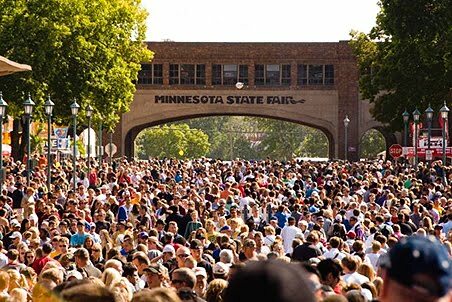 The State Fair will open next week on Thursday. 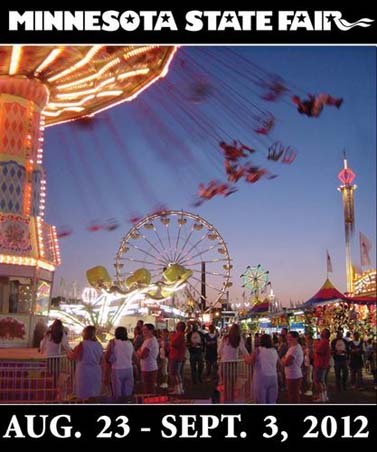 The combination of the State Fair and the Renaissance Festival are my twin demarcating events that signify the end of summer and the beginning of the fall season. By the time Ren Fest ends at the end of September, we'll have beautiful color in the growth along our hills and bluffs and the nights will be cool with the mild days that signify our autumn days here in the Upper Midwest. It is my favorite time of the year - a bittersweet time that I will be celebrating on the pages of my blog for the next few months. Have a wonderful weekend. You need to read the book called "The Night Circus." You will appreciate it! I do hope you will enjoy it. If you take it as the fantasy it is, I found it unique and very interesting and quite enjoyable.